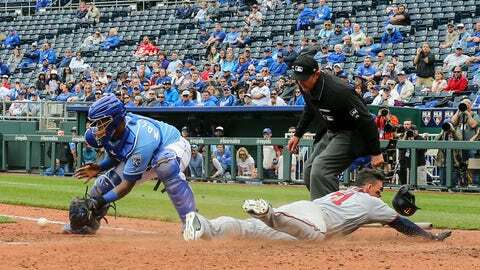 Twins first baseman Tyler Austin slides into home to score the game-tying run in the eighth inning as Royals catcher Martín Maldonado awaits the ball. KANSAS CITY, Mo. — Eddie Rosario hit a go-ahead single in the ninth inning and the Minnesota Twins again rallied late against Kansas City, beating the Royals 7-6 on Wednesday. After Max Kepler hit a tying, two-run single with two outs in the Minnesota eighth, Nelson Cruz drew a leadoff walk in the ninth from Wily Peralta (0-1). Oh, Gordo puts a hurtin' on this one and the #Royals are up 5-3! The game drew an announced crowd of 10,575. A day earlier, the Twins scored the tying run in the ninth and won 5-4 in the 10th on an RBI single by Cruz — a game that drew 10,024, the lowest at Kauffman Stadium in eight years. Despite surrendering a run in the bottom of the first, Twins starter Kyle Gibson cruised through 4 2/3 innings. But after retiring the first two hitters in the fifth, the next seven batters reached base — one on an error — and he left with the Royals leading 6-3. Homer Bailey, who was 1-14 with a 6.09 ERA last year with Cincinnati, was solid in his first Kansas City debut. He threw five innings, allowing five hits and three runs and striking out eight batters. But for the second consecutive day, the KC bullpen couldn’t shut down the Twins. Kansas City added Bailey to the roster prior to the game. RHP Chris Ellis, who made his major league debut Sunday, was designated for assignment.